In this anime series, a society of underground dwellers go about their daily lives, using giant digging machines to burrow their homes deep beneath the surface of the earth. When an invader from above threatens the society, some of the citizens and their machines must venture toward the surface to defend themselves and the human living above ground. The series originally aired on the TXN network in Japan in 2007. This episode recaps the events that happened in episodes 1 through 15, including the battles won and lives lost for the resilient Team Dai-Gurren. Trying to do her part in Team Dai-Gurren, Nia decides to become a cook, but just before the crew have a taste of her dishes, Cytomander, the fourth member of the Divine Generals, launches an aerial attack on the Dai-Gurren. Simon leads the counter-attack on the Gurren-Lagann, this time accompanied by Yoko, who replaces a sick Rossiu. Tengen Toppa Gurren Lagann is currently available to watch and stream on TV Tokyo. 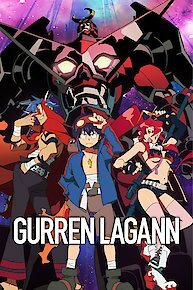 You can also buy, rent Tengen Toppa Gurren Lagann on demand at Netflix, Hulu online.